Manchester (United Kingdom) (AFP) - "Don't look back in anger". 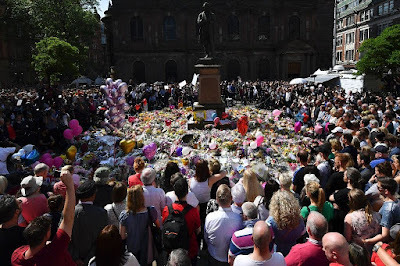 The now poignant words of legendary Manchester Britpop band Oasis rang out in a flower-filled square on Thursday, as a grieving crowd broke out in song after a minute's silence to remember the 22 people killed in Monday's suicide bombing. In a city with a proud musical heritage, this was a spontaneous message of defiance from people trying to come to terms with the heartbreaking massacre of innocent young victims who were themselves enjoying a pop concert. A woman clutching a bouquet of flowers among the crowd of hundreds started the refrain as others urged people to "sing up" to send a loud message to the attackers. Earlier the bells of St Ann's Church rang out as silence fell over the packed square. The minute's silence ended with applause which then melted into song. One man's cry of "We love Manchester!" marked the end of the musical tribute, followed by further applause as emotions ran high in the square. St Ann's has become the focal point for a city in mourning since the attack at the nearby Manchester Arena, where 22 people including children were killed after a concert by US pop star Ariana Grande on Monday. With so many children caught up in the attack, teddy bears, candles and heart-shaped balloons piled up in the square, along with notes of mourning and many messages stressing the need for unity within the city. "MCR stronger than hate, unwilling to fear" read one. "The City of Manchester stands united" said another. "It's a bereavement for all of us. 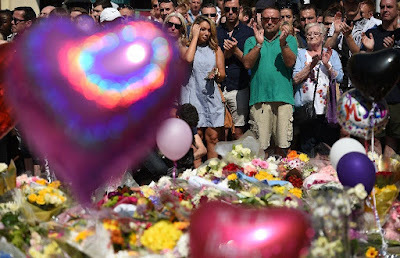 It's like your own family just passed away, it's just so, so sad," said 69-year-old Carmel McLaughlan, standing next to a sea of thousands of flowers. "There's just sadness hanging over Manchester at the moment. It's terrible, it's hard to believe it." Thursday's event followed a vigil on Tuesday in the city's Albert Square, attended by thousands, where a respectful silence was ended with cheers and a chants of "Manchester! Manchester! Manchester!" Queen Elizabeth II on Thursday visited some of the children wounded in the attack, telling them it had been "very wicked". 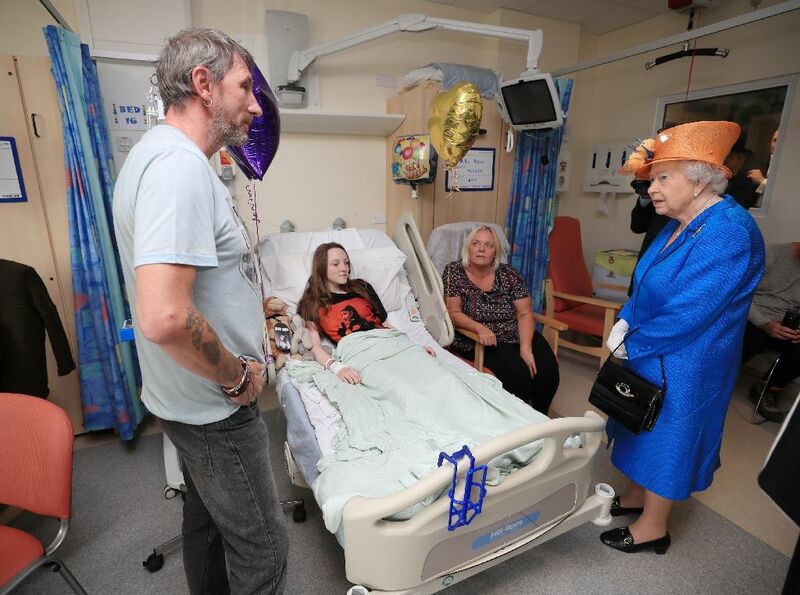 Twenty-three people remain in critical care while scores more remain in hospital with injuries sustained when 22-year-old bomber Salman Abedi detonated his explosive device. A forensics team dressed in white suits could be seen combing the steps leading to the Arena on Thursday, as police guarded a large cordon in place around the site. Inside the venue car park, vehicles still stood off-limits to their owners, while outside more bunches of flowers and cuddly toys lined the pavement. The wall has been lined with creations by young children at a local primary school, including paper flowers, doves and Manchester's worker bee symbol. "Sorry about the bomb that had happen and sorry if your family got hurt," wrote a child, one of many to share their thoughts neatly on a huge paper heart. "The unity of Manchester is as bright as a million lights. As One. Thought is with everybody," wrote a boy called Umar, on a note attached to violet paper flowers.